This picture of Liverpool to Birkenhead Tunnel comes from a short lived British magazine "Wonders of World Engineering". It appeared in the second edition published in March 1937. This is just an outline of the history of the Mersey Tunnels. Any one who wants to get more information is recommended to refer to one of the sources at the bottom of this page. There are many tunnels in the Liverpool area, including sundry rail tunnels and those of the Mole of Edge Hill. Geologically the area is mainly a mixture of sandstone and clay. The area that the Mersey road tunnels go through is largely clay near the entrances, but rock (covered by clay) under the river. Some of the areas of rock have faults. With or without faults, drainage can be a major problem in tunnels. It's not just the river water! Even under land, tunnels may be below the water table. Proposals for a road crossing the Mersey go back to at least 1825. It was nearly a 100 years before much happened. Passengers had 2 main ways of crossing from Liverpool. There were ferry boats to various points on the Wirral peninsula; by the 1920's they were carrying about 35 million passengers a year. The trains were carrying over 10 million passengers a year. In 1922 a committee was set up between Liverpool, Birkenhead, Bootle and Wallasey to draw up plans for a crossing. The crossing was probably intended as much for business use as for motorists. The ferries and railway could cope with the passengers, but they could not cope very well with goods traffic. There was to be a tramway in the bottom half of the Tunnel. The work during the construction would also help to reduce unemployment. The committee was chaired by Sir Archibald Salvidge from Liverpool. He was the main driving force in getting the crossing. When it was decided that the crossing route would be between Liverpool and Birkenhead, Bootle and Wallasey left the committee. A major decision was whether it would be a bridge or a tunnel. It was thought that a tunnel would be much cheaper to build and maintain. They also thought that a bridge could be damaged or block the river if there was a war. Any bridge supports on the river bed might have caused silting. The plan for a tunnel was ambitious, it would be the largest underwater tunnel ever built. Another major decision was how the construction was to be financed. The government wanted the crossing to be free of any Tolls, but after several years of negotiations it was agreed that the government would pay half the construction cost, one quarter would come from the rates in Liverpool and Birkenhead and one quarter from Tolls for a period of up to 20 years. (The running costs of the Tunnel were to come from the rates.) 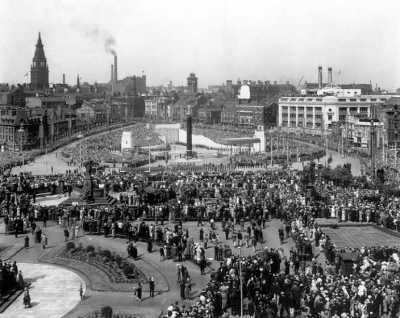 This was authorised in a 1925 Act and a Mersey Tunnel Joint Committee was formed comprising of Birkenhead and Liverpool Corporations. About this time the proposals for the tramway were put on hold. There were various possible reasons for this. One was opposition from Birkenhead who wanted to protect their Ferries, another was that the government had said that they would reduce their contribution if a tramway was laid. The Tunnel would however still be excavated and built for most of it's length with a massive space under the roadway designed for the Tramway. A further Act was needed in 1927 mainly because the siting of the Birkenhead entrance was changed, which led to an increase in costs. The Tolls were now to apply for up to 25 years. In 1928 there was a further Act to again change the Birkenhead entrance and also to move the Liverpool entrance from Whitechapel to the Old Haymarket. But the overall cost and Toll period was the same. 1933 saw yet another Act. This time the costs had increased by a massive 40%. This seems to have been mainly due to an incident in an American road tunnel, and a decision that there had to be a massive improvement to ventilation. (This of course wouldn't have happened with a bridge!) As the government would not give any more money, the Tolls were now to last for up to 40 years. While all these Acts were being passed the actual construction started at end of 1925. It was a mammoth undertaking involving thousands of workers. The engineers in charge were John Brodie, Sir Maurice Fitzmaurice, and Basil Mott. The main tunnel (there were branch tunnels at either end) would be 2 miles 230 yards long, and it would be wide enough for 4 lanes of traffic with a total interior diameter of 44 feet. The construction continued through various difficulties with excavation and drainage, and the unfortunate deaths of workers. 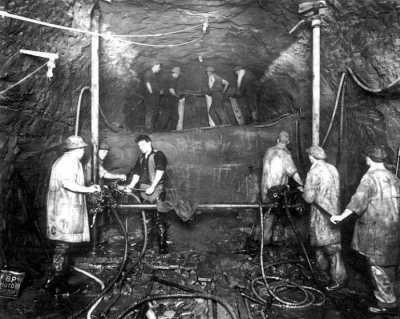 1,200,000 tons of rock were excavated using explosives and pneumatic drills between 1926 and 1931. The rock went to fill in Storeton Quarry on the Wirral side and to Dingle and Otterspool on the Liverpool side. The general technique used was to excavate and line the top (road) half of the tunnel, and then to excavate and line the bottom (tramway) half of the tunnel. The main Mersey Tunnel has a circular section for most of it's length, presumably due to the tramway. There is a branch tunnel on each side of the river. The branches are semi circles with just a shallow space beneath the roadway. Part of the land sections of the "tunnel" were not tunnelled; they were built using cut and fill techniques; this includes the part which runs below Dale Street down towards the river. 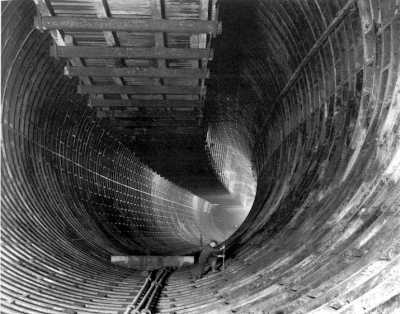 The construction of the tunnel was massive in itself, but it also involved construction of gigantic ventilating machinery, shafts and buildings. The final cost of the tunnel and all the machinery etc was just over £6 million. With land and other bits and pieces this came to nearly £7 million or £7.5 million if you add the cost of borrowing during the construction. The Tunnel was eventually brought into use on 17 December 1933, with an official opening on 18 July 1934. The King and Queen went on to open a new Central Library in Birkenhead, the original Carnegie Library having been chosen as the final site of the Birkenhead entrance to the Tunnel! At the opening the King spoke the words "Who can reflect without awe that the will and power of man which in our own time have created the noble bridges of the Thames, the Forth, the Hudson and Sydney Harbour, can drive also tunnels such as this, wherein many streams of wheeled traffic may run in light and safety below the depth and turbulence of a tidal water bearing the ships of the world." Use of the Birkenhead Tunnels built up to a higher level of use than expected. The result was that by about 1947, Birkenhead and Liverpool were not having to pay anything for the upkeep or debt on the tunnel. 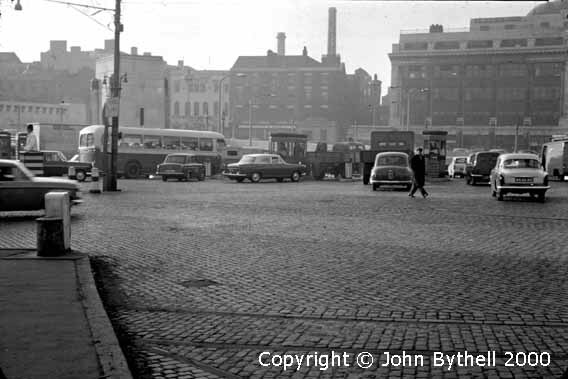 And by about 1970 the Birkenhead Tunnel should have become Toll free. 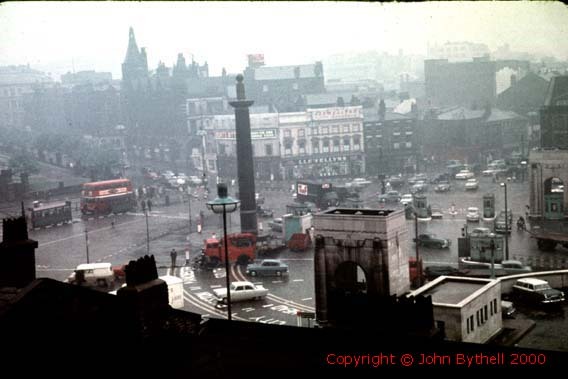 Taken from top of old Co-op building in Byrom St on a miserable day. Taken from William Brown Street. 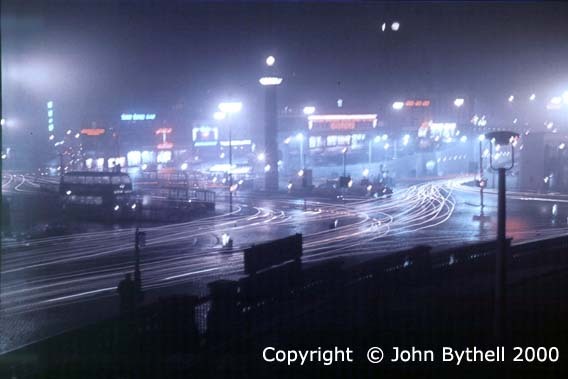 Taken from William Brown Street on a wet night. 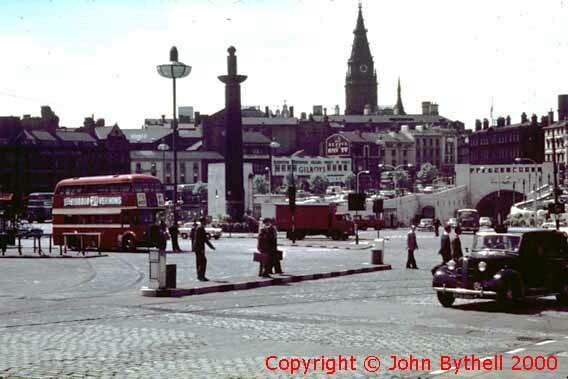 With increasing levels of car use, the Birkenhead Tunnel could not cope, and by 1960s there was severe congestion on the roads around the Tunnel at peak periods. Liverpool and Birkenhead both decided about 1965 to build flyovers etc. This was to segregate Tunnel traffic from other traffic, provide queuing areas and thus reduce congestion. Liverpool and Birkenhead paid for these road works, but it appears that there was some agreement that the Tunnels would later reimburse Birkenhead for the cost of Birkenhead roadworks which amounted to about £5.7 million or about £60 million at 2003 prices. (At the end of the 1990s Wirral demolished some of the Birkenhead flyovers.). At the same time as the work alleviating some of the road congestion around the Tunnel entrances, it was decided that a second crossing would be needed. Consultants were appointed and they recommended a 6 lane bridge. Because of the cost, and uncertainty as to which was the best route for a bridge, the authorities decided on a 2 lane tunnel. 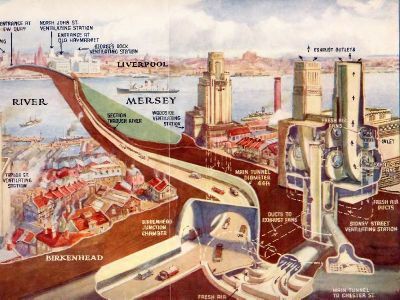 The new tunnel would run from just north of the old tunnel on the Liverpool side, and on the Wirral side would come out at Seacombe (Wallasey). The Wallasey approach would make use of a disused railway cutting to link up to what would be the M53. The construction cost (excluding land) was estimated at less than £14 million, and an Act was passed in 1965 authorising the construction. Wallasey joined Birkenhead and Liverpool on the Mersey Tunnels Joint Cttee in September of 1965. The provisions in respect of Tolls were changed so that neither the old Birkenhead Tunnel nor the new Wallasey Tunnel would become free of Tolls till the debts on both tunnels were paid off. It was later decided to add another 2 lane tube to the Tunnel. It would share the Approach roads etc of the first 2 lane tube. This was provided for in a 1968 Act. The estimated construction cost for this second tube was £7.5 million. Compared with the construction nearly 40 years earlier of the Birkenhead Tunnel, that of the Wallasey tunnels was far more mechanised. Use was made of huge mechanical moles to excavate the tunnel tubes. They could excavate a 200 foot length in a week. The final cost for both tubes was over £37 million including £3.5 million for land. Apart from any other factor there had been the usual "unexpected" difficulties that seem to occur with Tunnels and other large construction projects. Adjusting for many years of inflation can not be accurate, but the Wallasey tunnel appears to have cost about 20% more in real terms than the Birkenhead tunnel. This is probably because any savings in construction costs of Tunnels were more than offset by the substantial spending on approaches. The Wallasey Tunnel was officially opened by the Queen on 24 June 1971. On Sunday 27th there was a charity walk through the tunnel, and it was really opened to traffic from midnight on 27th. About the same time, the Tunnel toll was raised from 10p to 15p. The Tunnels were now making substantial losses. There were various reasons:- the cost of the new Tunnel, the fact that construction cost was far higher than expected, traffic stopped growing either due to the increase in Tolls and or the state of the economy. Some limited power to add these losses to debt was obtained in a 1972 Act, but these powers were to run out in 1980 at the latest. Adding the losses to debts further increased future losses. Unsuccessful attempts were made to get financial aid from central government. There was some falling off in use due to all these increases but total Toll income increased substantially over all these years. Despite this increase in total Toll income the annual rate of losses actually increased, mainly due to high inflation and high interest rates. Eventually the powers to add losses to debt ran out, and they had to be met from the Rates. This was the situation between October 1988 and March 1992. But there were further Toll increases to 60p in 1989 and then £1 in April 1992. The combination of these further substantial Toll increases plus the 3 and a half year breathing space meant that losses had now stopped altogether. There was a further Toll rise to £1.20 in 1999. The use of the Tunnels has crept up slightly in recent years, but is still far below that forecast when the Wallasey Tunnel was built.. In 1993 Merseytravel started to raid the Tunnels funds, originally with the aim of helping to pay for the losses on the Ferries. This was illegal according to the Mersey Tunnels legislation, but Merseytravel got a legal opinion to say that it was. They later decided that they would try and get the law changed with three purposes - a) to make it legal for them to take the Tunnels money, b) to make it easier to get toll increases and thus take more money, and c) to privatise the operation of the Tunnels. To remove some of the opposition to their scheme, they eventually dropped the third aim, and managed to force their scheme into law as the Mersey Tunnels Act 2004. Merseytravel have not managed to get all the toll increases that they expected because of opposition from the MTUA and others. But since 2004, the car toll has been increased five times - April 2005 from one pound 20 to one pound 30, April 2008 to one pound 40, April 2011 to one pound 50, April 2013 to one pound 60, April 2014 to one pound 70. As you can see the frequency of the increase has risen, this is partly because Merseytravel now turn a deaf ear to the protests and partly because they want to set a high level of tolls for when they are introduced on the Runcorn bridge. - Archives kept in Liverpool Central Library. - "Underground Liverpool" by Jim Moore, published by the Bluecoat Press in 1988. This is a fascinating account of all the Liverpool tunnels, including the Mole of Edge Hill, the many rail tunnels etc. The book is probably out of print, but can be obtained at the Book Clearance Centre in St John's Precinct. - 2 booklets published by the old Mersey Tunnel Joints Committee. They are called "Mersey Tunnels - The Story of an Undertaking" and "Mersey Tunnels 2". They are in Birkenhead and Liverpool central libraries, and some branch libraries. The BBC have a good section on the Birkenhead Tunnel at BBC Tunnels. It was not used as a source and therefore complements what is on this page. The 3 pictures of building and opening of Birkenhead Tunnel are from Stewart Bale Collection Courtesy of National Museums Liverpool (Merseyside Maritime Museum). If there are any experts out there who can suggest corrections or improvements to this History of the Tunnels, then please contact us via the Home Page.